Following letter can be used as a sample by people who are trying to ale their electric goods. With all my due respect, I am writing this letter to inform you that I am going to Australia on permanent basis. As I told you that I have some Mechanical Machinery which is I am willing to sale out as it is of no use now for me. The Machines are in good condition and are working properly. I have all original documents of purchase with me. Please find attached pictures of the machines and if you are satisfied then please quote the amount so we can make a deal. I am looking forward to your response. Thank you. I hope this letter receives you in good health. I am writing this letter to inform you that I have some construction machinery which I am willing to sale out as my recent medical injury has deemed me unfit for work. So, it is of no use now for me. The machines are in great condition and are working properly. Please find attached pictures of the machines, and if you are interested then please get back to me at my number or my email which I shall attach below. Sample cover letter for ISP sales consultant with experience or no experience. Consultative sales cover letter. I am writing to you because I would like to apply for ISP sales consultant job. I have all the relevant experience you are looking for in a person. I have worked for many sales marketing companies from different backgrounds. I have gained much knowledge from the years that I have been in this type of work and I have love every moment of it. I would like the chance to work with a different company with different products so that I can gain more knowledge and have a different experience. Work with new people with a new client audience. I am a good hard worker. I work best independently however I can work in a team as well. I am very determined and motivated when I have a goal in mind or I have been given a target I like to reach it and go beyond. I hope to hear from you soon. You will find attached my full up to date CV with all of my contact details. You can contact me best by text message or email. Sample letter to place an order or purchase order to supplier, contractor etc for office supplies etc. Sir, this is Mr. Powell Grey from PRS Repairs Co. and I would like to place an order for some of your specific products. We first started using your products 2 years ago and till today we have not received any complaints from our clients regarding the products that your company manufactures. Keeping that in mind, we would like to make sure that our relationship keeps getting stronger. I would like to place an order of 10,000 bulbs and 5000 tube lights. I wish to receive them in 2 weeks’ time. Thank you for your generous behavior. CEO, PRS Repairs and Co. I would like to place an order of dresses. I have been checking a lot of dresses lately on your website and find it very interesting. My order numbers are: D52 in yellow color in small size and 9rD6 in blue color in small size. Kindly let me know the mode of payment of this order. Hope it will be pleasure shopping from you. Sample job application letter for sales manager, zonal sales manager, area sales manager, branch sales manager and regional sales manager to apply for sales jobs of manager level. This is with reference to captioned subject and your requirement published in leading newspaper of the Country dated February 07. I am an MBA Marketing graduate from Oxford University. Thereafter, I joined XYZ as intern to add value to my professional competence. This value addition was one of the learning outcomes of our graduation program as well. On completion of internship, I got selected by re-known business hub as a Sales Executive. I served there for 2 years with an outstanding employment record wherein I promoted to Assistant Manager within one year of my joining and then Manager Sales in the next year as a part of my promotion package. I am fully aware of the roles and responsibilities of Sales Manager. My resume is enclosed herewith for your kind perusal. I am confident that my professional attributes will be suited to your Organization. I hope this letter finds you in good health. I have recently come to know via LinkedIn that your company needs a sales manager in the UAE. My profile is in agreement with the requirement of the job. My 17 years of inbound and outbound B2B sales have turned me the expert in implementation of the new business models for effective achievement of the sales targets. My accomplishments as the business manager have been recognized by the organizations, I have worked for so far in my business carrier. I emphasize on the fast growth by meeting the challenging sales targets. Customer retention and commodity resale are my area of interests. All the required document along with my detailed resume are enclosed with this application letter. Kindly consider my profile for the position mentioned in the subject. It would be my pleasure to hear response from you. 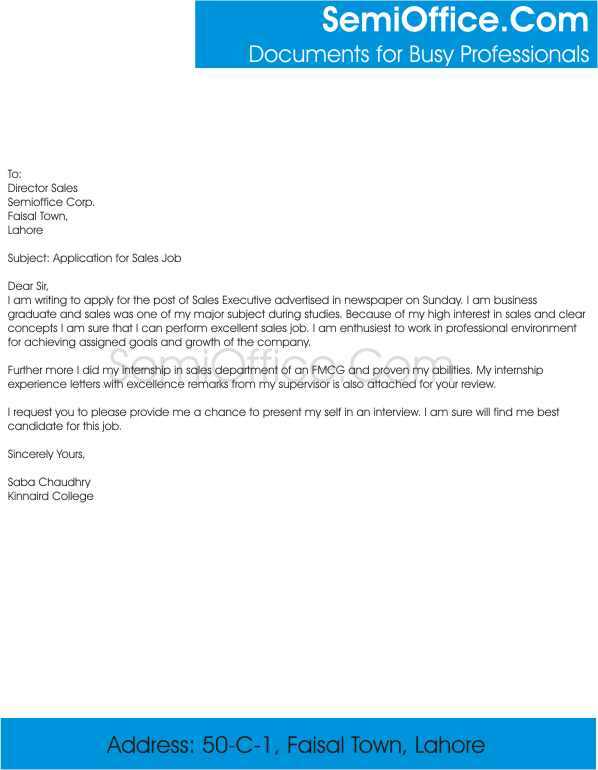 Sample job application letter for salesboy job in companies, offices, marketing firms, distribution companies etc. With due respected it is stated that I saw your ad in a newspaper for the vacancy of sales boy at your pharmacy, sir; I would like to tell you that I am a diploma holder in pharmacy course. I have experience of 3 years at a pharmacy in khanewal but now as I have moved to Lahore, I am looking for a job, I would like you to consider my application and my resume attached with the application. I shall be really thankful if you give me a chance to serve your pharmacy, looking forward for a positive response. Thanks. It was mentioned on your website for an opening of a job for a sales boy. I have worked in this field for the last few years. I would like to join your company in the post as mentioned above. Hoping for a positive response from your side. I have seen your ad in weekly journal by which I came to know that you are hiring sales boys for working in your store in second shift. As per the requirements of the ad, I think I am a healthy choice for the said post. I have attached my CV with the application. My previous experience as sales boy will also amount to make me a better choice. Please allow me to have a seat with you for the purpose of being interviewed. I shall be waiting for a call from your side. Thank you so much. Sample of English job application letter for sales girl in Mumbai, Dubai, Delhi, London, Sydney, or New York or any other city and star hotels etc. I am a fresh graduate looking for professional environment where I can learn and enhance my skills. I seek a post where I can contribute my efforts to company. Therefore I am applying in your company for the post of Sales Girl. I have all the required qualifications you need and stand up to meet the standards of proper market trends. I have been fairly active during my business studies. Also I have a good experience in sales as assistant in your company already. Please find all documents attached and verified to this application. Any further information or reference can be updated on demand. With due respect it is stated that, I am Maria Ali; I have recently completed my intermediate degree from college. Sir my father had a cardiac arrest last year and now he is not able to do his job. I have 3 younger siblings who are in their schooling period. Sir we are suffering from a hard time, we are living from hand to mouth. There is less income are expenses are more that we can afford. Sir I saw your ad that you need a sales girl, you have asked for one year experience but I have no work experience as I have done nothing except studies, I am not forcing you but insisting you that please give me a chance to prove myself, I assure you that you will have no complaints from my side. I will take care of my responsibilities as I can assure that I am a responsible person and understands the reputation of your restaurant. I shall be really thankful if you consider my application, looking forward for a positive response. Thanks. I assure you that I could enhance your sales with the techniques which I have learnt in the subject of marketing during studies and from the practical experience of previous jobs.With reference to your advertisement with respect to the subject post of a sale-girl in your organization, allow me to address the subject vacancy apply as my qualification and previous experience of jobs is quite right for this post. With due respect, I am writing this letter to inform you that I have applied in your outlet as a sales girl. I got to know about this job through a friend. I have 3 years of experience of working as a sales girl in one of your competitive brands. I left the previous job because I have shifted from that area. I am writing this letter to you so that I can send you my CV for job. I have seen your ad online on a website and applied for sales girl post in your organization online. They shortlisted me and want me to write letter to organization so that you will able to know about the submission of form online, and want me to send my Cv with it. I have attached my Cv with the letter please go through my Cv. Acknowledgement letter to company for decrease in sales due to high prices and high competition with explanation of market situation. We are losing sale due to high rate of our products. Compare others company. Subject: Identification of problem causing the decline in sales. The Company is dealing in a large number of products which are very different in nature. The sales force is also not divided into product line wise. The company is not able to spend enough on R&D which is vital for survival in sheer competition in the market due to very large number of products. The company is unable to allocate the resources to all the products thus the large number of products are obsoleting. The Company needs to shut down more than 40 % of the product lines so that the products we are best at get the proper attention. The continuous change in the market requires consistent improvements in our products to survive the competition. I am requesting you to allow me to assemble a team to develop a strategy to help us revive again as the market leader. Sample sales letter to sale the products, brands of your company or shop to the customers. 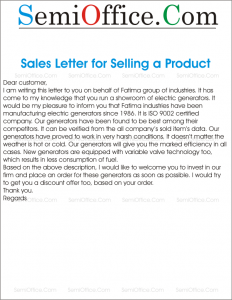 This sales letter can be sent on letter head, email or delivered with the product sample. We proudly present our new security system “The Door Knock” . This is the best and the latest security system of our company. It installs beside the main entrance door. First of all it in the shape of the wall light so any person can’t even think about camera in such a place. It has motion detector that alerts you when someone comes near the door. Further it runs on Wi-Fi and can connect to your smart phone. It also has a small speaker from which you can talk to the person at the door without opening the door. It has been approved by the National Security Council. To order your Door Knock please call on our following numbers. 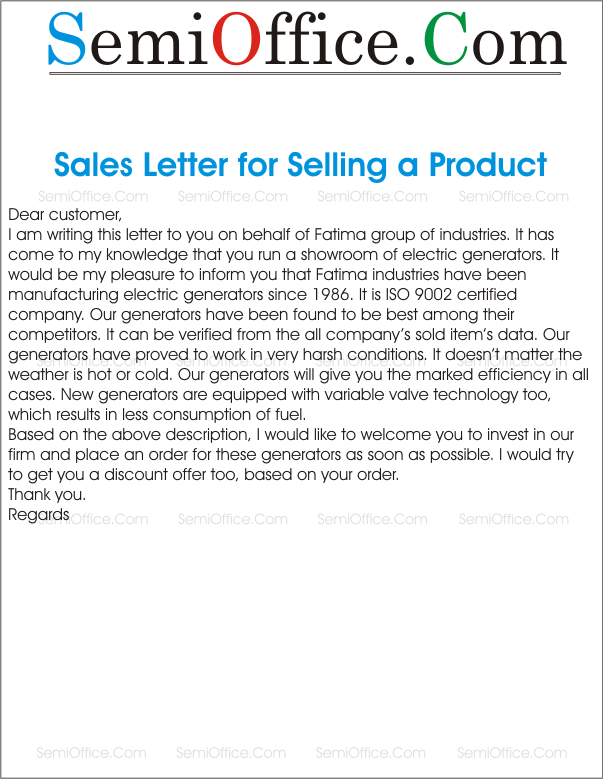 I am writing this letter to you on behalf of Fatima group of industries. It has come to my knowledge that you run a showroom of electric generators. It would be my pleasure to inform you that Fatima industries have been manufacturing electric generators since 1986. It is ISO 9002 certified company. Our generators have been found to be best among their competitors. It can be verified from the all company’s sold item’s data. Our generators have proved to work in very harsh conditions. It doesn’t matter the weather is hot or cold. Our generators will give you the marked efficiency in all cases. New generators are equipped with variable valve technology too, which results in less consumption of fuel. Based on the above description, I would like to welcome you to invest in our firm and place an order for these generators as soon as possible. I would try to get you a discount offer too, based on your order. Sample experience letter for area sales manager from company, distributors, suppliers and logistic companies to area managers, area sales managers and territory managers. It is to certify that Ms. Jaffery Shaw has worked on the post of Area Sales Manager at Gloria Stores United States for three years starting from 2012. During the job tenure his performance was excellent and he achieved all the assigned area sales targets in California State of USA. He also wins many performance awards and one award of best employee of the year during 2013 from Gloria Stores. We are sure he can turn any stone for the success and wish him best of luck for future. This is hereby certifying that Mr. Qqqq, s/o wwww has been working with us in Kim’s foods as an area sales manager for 5 years. During his tenure we have found him wise, clever and brilliant minded guy. He was good to complete his task and covered his area of sales. He is punctual and sincere with his work and commitment. I am glad to write for him. Sample job application for sales associate, retail sales associate and executive, salesman, sales officer, sales clerk or assistant sales executive in companies, marketing agencies, distributors and suppliers for free download. I hope this email finds you well. I’m interested in working at your organization MDK Corporation Japan as a Sales Executive. I have recently graduated from IBA and I have returned to Lahore. Please find a copy of my resume attached to this e-mail which could be considered for this position or any opportunity at your company that seems relevant to my profile. I’m also available for interviews on Skype or in person given an adequate time period’s notice. Looking forward to hear from you. I am writing to apply for the post of Sales Associate advertised in newspaper on Sunday. I am business graduate and sales was one of my major subject during studies. Because of my high interest in sales and clear concepts I am sure that I can perform excellent sales job. I am enthusiast to work in professional environment for achieving assigned goals and growth of the company. Further more I did my internship in sales department of an FMCG and proven my abilities with company sales associates. My internship experience letter with excellence remarks from my supervisor is also attached for your review. I request you to please provide me a chance to present my self in an interview. I am sure you will find me best candidate for this job. I am interested in the position advertised for Sales Associate. My resume enclosed for your review, given my related experience and excellent capabilities. I would appreciate your consideration for this job opening. My skill is an ideal match for this position. I appreciate your taking the time to review my credentials and experience again thank you for consideration. Your advertisement for a Sales Officer interested me because your requirements closely parallel my working experience. I’ll be happy to tell more about my experience in an interview.I attach my C.V and cover letter with this E-mail.I shall be very greatful to you.